The best way to explore the city is by car rental from the Cape Town Airport CPT. With the offers from the price comparison on Driveboo you can pick-up your rental car directly at Cape Town Airport. Rent a cheap car and explore the city on your own before departure. So you can enjoy your stay to the fullest. Cape Town is the second-largest city in South Africa and is located in the southwest of the country. A rental car gives you maximum flexibility to explore the big region. The easiest way to reach places of interest is by car, such as the impressive harbour of Alfred & Victoria Waterfront or the Castle of Good Hope. To the beaches and the attractive suburbs like Camps Bay you can also drive comfortably and cheaply with the rental car. Visit Table Mountain, the landmark of Cape Town. The sooner you compare the offers at Driveboo, the better conditions we can offer you. If you have any further questions, please contact our service team. Cape Town International Airport is the second largest airport in South Africa and the third-largest airport on the continent. It was opened in 1954 and was last renovated and extended on the occasion of the 2010 Football World Cup. Cape Town Airport is identified by the IATA code "CPT". More than ten million passengers take off and land here every year. 24 airlines connect the airport to almost 100 destinations in Africa, Europe, America and Asia. However, some international flights are only offered during the high season between October and March. The CPT has two terminals: one for international and one for domestic flights. Both are connected by a central check-in area. The international terminal is located in the northern part of the airport building. At the airport you will also find services such as restaurants, car hire and exchange offices. Here you can rent a car cheaply. The car hire counters are located in a separate car rental area across from the terminals. Leave the main building and walk for a few minutes through the underground passage for pedestrians. This will take you directly to Cape Town International Airport. If you have agreed to return your car with a full tank when you rent it, you can refuel your car at one of Cape Town's many filling stations. In the city area and along the highways you will find numerous possibilities. Many petrol stations only accept cash. That's why the offer of car rental sometimes includes a fuel card, which you can show at the petrol station. The total amount for refueling will then be credited to you at the end of your stay. There is also a petrol station directly at the airport entrance. Please note, however, that there is no self-service at the gas station in South Africa. Instead, a tank attendant fills the car with the desired fuel. You must first name the amount for which you want to fill up or ask for a full tank. The airport is located about 22 kilometers east of Cape Town. If you rent a car at the airport, you can reach the city center in about 30 minutes under favourable traffic conditions. Leave the airport from the car hire and pick-up station and take the N2 motorway to Cape Town. Allow sufficient time for the trip between Cape Town International Airport and Cape Town. During rush hour traffic, the roads are often very busy. What speed limits apply in Cape Town? There are numerous speed controls in South Africa. In addition, so-called bumpers are to ensure that the vehicle is not driven too fast. These are transverse installations on the road which can only be crossed slowly. A bumper can be found on the access road at the airport. In addition, adhere as closely as possible to other traffic regulations, such as compulsory seat belts, in order to avoid the strict penalties. In Cape Town, visitors experience a unique blend of vibrant metropolis, impressive mountains and blue sea. Rent a car cheaply and enjoy the city and its surroundings in the typical sunny weather that characterizes South Africa. Table Mountain is the landmark of Cape Town and thanks to its concise form with the large plateau is known worldwide. It rises above the city and dominates the skyline of Cape Town. By rental car you can reach Table Mountain quickly and cheaply. Park your rental car at the foot of the mountain and take the cable car uphill in a gondola. 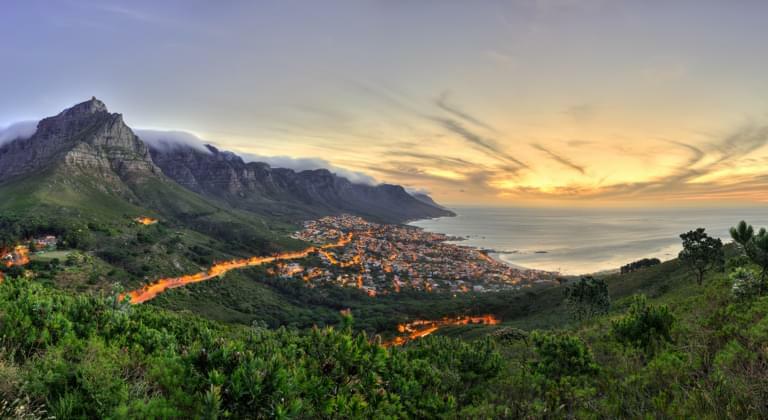 From above you enjoy an impressive view over Cape Town, the Atlantic Ocean and neighboring towns like Camps Bay. The Victoria & Alfred Waterfront in Cape Town is one of the most impressive and versatile excursion destinations in South Africa. The lively and modern entertainment district at the harbour is home to restaurants, shopping, bars, theatres, museums, cinemas, hotels, an aquarium and many other entertainment and tourist attractions. Park your rental car and take a tour of the harbour. The ferries to the former prison island Robben Island also start here. If you have explored Cape Town by rental car, you can make numerous excursions in the beautiful surroundings. For example, drive to Camps Bay, where some of the region's most popular beaches are located. In Camp Bay you can enjoy long sandy beaches and swim, surf or dive in the Atlantic Ocean. The palm-clad promenades with their cafés and restaurants also attract many visitors. Rent a car to reach Cape Town, Camps Bay, Table Mountain and many other places worth visiting in a convenient and convenient way. Whether convertible, SUV or small car: via Car rental-Check. de you can rent your dream car for your holiday in South Africa.